Custom Catios designs and builds one-of-a-kind catios for discerning homeowners. We utilize a team of professionals unlike any other pet enclosure company to create structures that add to the aesthetic of your home. Our architect uses professional software to create 3D renderings and videos designed to ensure the catio is to your liking. Our lead builder is a licensed general contractor who has built homes from the ground up. On any given day, we might have as many as six workers on site painstakingly crafting the intricate internal boards that run along the inside of our catios. Overall, catio construction projects normally take from 3 to 5 days to complete. This aspect of what we do is the hardest to convey to prospective catio owners. And our clients are always surprised by the manpower and labor that goes into building a Custom Catio. Each internal floor board, for example, is hand crafted to fit precisely into the catio, painted and fitted with industrial strength carpet for added feline gripping and security. This is a long and arduous process, but it is necessary to deliver the best possible catio for cats and humans alike. 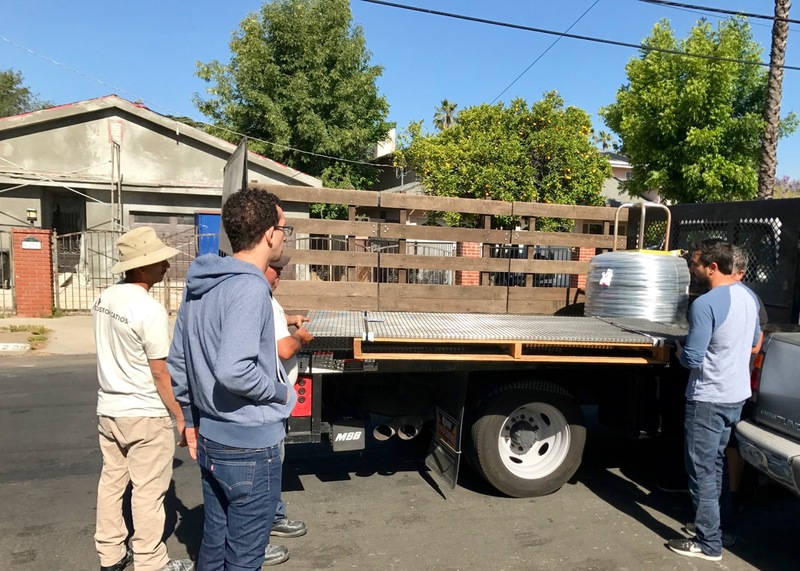 The photo shows our architect, lead builder and two other members of our team accepting delivery of wire mesh which will then be painted and secured to a wood frame. It truly takes a team to build a Custom Catio!